This topic has been beaten to death. Why are we still talking about it? Reality check: How many Twitter followers does your blog/brand have? It’s safe to say that the core concepts of gaining and retaining Twitter followers haven’t changed drastically, but there are some adjustments we need to make – not to mention going back to the basics and reminding ourselves. It’s easy to become lazy complacent and not make a genuine effort anymore. So, how to get more Twitter followers? Editor’s note: This post was written by Jeff Foster, co-founder and CEO at Tomoson, the influencer marketplace. The platform allows bloggers and social media influencers to get paid for posting sponsored content, and lets businesses connect with targeted, niche audiences. Social media is now a critical component of any marketing campaign. Used correctly, it builds an army of enthusiastic ambassadors for your brand. But social media is a double-edged sword. Negative reviews, PR blunders and inconsistent brand messages are constant dangers – threats that you need to guard against. Brand protection has to be an integral part of your social media strategy, otherwise you are putting your brand at risk. While it takes time to build an online brand, your employees can damage it very quickly – often without meaning to. There are well-publicized examples of this. For example, when a US Airways employee tweeted a very graphic image on the company’s Twitter account. Sometimes, however, the damage can be more subtle. Let’s assume that someone in your marketing department sets up an unofficial branded hashtag, which they use to tweet company news – all with the best intentions. But if they do this without tying into your social media strategy, they can end up sending confusing messages that devalue your brand. To avoid this and protect your brand on social media, put in place a clear social media policy. This should tell your staff things like who is authorized to post content, what approvals are needed, and what type of content can be posted. Also make sure that this addresses your employees’ private social media accounts – tell them exactly what they can and can’t do with their own accounts. Finally, make your acceptable use policy clear to your followers on social media. For example, state on your Facebook page that you’ll delete readers’ comments if they contain or link to pornographic, racist or other types of unacceptable content. By saying this upfront, you’ll reduce any social media backlash when you censor what readers have to say. You should also monitor social media for what people say about you. Look at overall sentiment, but also identify specific negative comments. There are several great tools you can use to do this, including Google Alerts, Trackur, SocialMention and BlitzMetrics. The advantage of these tools is that they don’t just monitor your own social media channels – they can monitor the entire social media universe. When you do find negative comments, don’t make the mistake of arguing online. Craft a reasonable response to what the author has to say. This will reduce the impact of the comment for other readers. If they do respond positively, offer to talk to them offline to address any concerns they might have. Also watch for sites that rank highly for your company name – or for other brand-related keywords that you use. It’s easy for someone to set up a site with the intent of damaging your business, or even impersonating it for fraudulent reasons. You need to intercept these sites quickly – and you may even need to take legal action to get them shut down. No matter how hard you try, you won’t be able to silence all your detractors on social media. Negative feedback is just a fact of life. But you can offset it by creating a constant positive buzz around your brand. This will drown out negative comments – or at least push them into the background. However, you can’t create buzz by yourself – in fact, readers won’t believe you if you try to do this. Instead, you need to use sites like Tomoson to get influencers talking about your products or services. People trust bloggers and other online thought leaders – much more than they trust company advertising. Creating positive relations with bloggers is a major topic in itself, but here are a few key things you need to know. First of all, bloggers value their independent voice – and so do their readers. So even if you pay bloggers to write posts, don’t try to bend them to your will. Second, bloggers want to know that you are interested in them – so take the time to read their blog posts and express genuine interest. Third, you need to give bloggers something to talk about, so avoid boring marketing pitches – roll up your sleeves and get creative. Finally, remember that bloggers are not the only influencers. When your customers talk about your brand, they are selling it at the same time. People will naturally make some comments, but you need to encourage them to say more. For example, by simply responding quickly and positively to comments, you can spark more conversation. Retweeting comments is another good strategy, although you shouldn’t spam your followers by doing this too much. Another good approach is to run an online contest where you ask readers what they love about your brand – and then give prizes for the best comments. Unless your business directly involves religion or politics, you shouldn’t discuss these subjects on social media. Even if what you say is innocuous, you’re going to offend some people in your audience. There’s usually no upside in talking about controversial subjects – and there’s always a downside. Religion and politics aren’t the only controversial topics, so always think about whether you could offend before you post or tweet something. It’s also a big mistake to exploit natural disasters and other tragedies to promote your brand online. This may seem obvious, but even leading brands get it wrong. 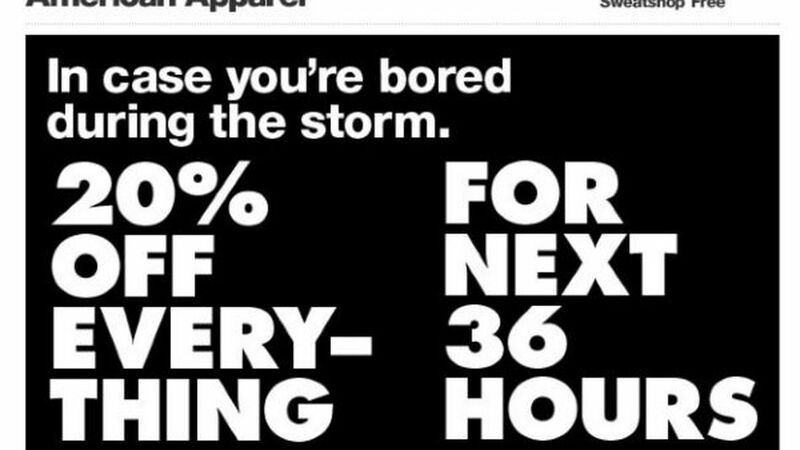 For example, when Hurricane Sandy struck the US East Coast in 2012, American Apparel sent out an email blast offering 20% off everything, “in case you’re bored during the storm.” There was a huge social media backlash, including tweets such as “I will forever boycott their stores.” Amazingly, American Apparel wasn’t the only retailer to get this wrong – GAP also incensed the Twitterverse, with a similar post encouraging Sandy victims to shop online at Gap.com. Editor’s note: This post was written by Kevin, an account director at Online Rep Management. He has been working in internet marketing and public relations for over 8 years. Kevin got his start working online in SEO, link building, and some affiliate marketing. Kevin is most passionate about helping good brands become online entities. Read more on Google+ follow Kevin on Twitter! The relationship between reputation and brand is so tightly knit, it is difficult to separate them, or know where one ends and the other begins. Like love and marriage, it is difficult to have one without the other. Unlike the chicken and the egg, we are pretty sure which comes first. Editor’s note: This post was written by Pratik Dholakiya, co-founder & VP of Marketing of E2M and OnlyDesign. He’s passionate about fitness, start-ups, entrepreneurship & all things digital marketing. You can find him on twitter @DholakiyaPratik to discuss on any of these topics. We are witnessing a new era in branding: the emergence of personal branding as a means of marketing one’s business. You’ve got CEOs of companies trying to establish personal credibility that rubs off on their company’s brand; there are digital marketing managers out there who are trying to come across as authority figures in their niche to market various products and services, and then there are business owners who sometimes have more visibility than their brands, courtesy of personal branding. A big reason why people want to build a personal brand is that it is seen as yet another way of boosting visibility of a business, albeit in an indirect manner. It is also seen as a great way of adding to the ‘credibility juice’ that surrounds a particular brand. The saying ‘You are known by the company you keep’ explains the use of personal branding best. By increasing personal credibility, you are essentially trying to enhance the trustworthiness of your brand by association. And it is working. Forbes has a nice article that serves as a guide to building your personal brand. It talks about the importance of building a personal brand and how you can go about creating an effective one. The old adage is as true today as it ever was. A name is just a word, unless it is leveraged correctly. When you look across the business landscape, there are dozens of examples of business people who have leveraged their name to add value to their brand and their offerings. Years ago no one took blogging seriously. Blogging was for people who wanted to write about their hobbies or have their own little journal on the internet. Now it’s a requirement to have a blog for your brand or business. If you still don’t have a blog of your own, you are missing out big time! In this post I’m going to tell you exactly why you need to have a blog and how you can grow your brand and reputation in the process. Before we get started, I’m going to tell you a bit about myself. I first started making money online in the mid to late 90s, and I didn’t start blogging until 2007. This was a huge mistake to wait this long, but when I did finally start blogging, I saw immediate returns. The first blog I started was the main blog I still run today, which is at ZacJohnson.com. The blog is all about my journey in the world of online marketing and blogging. Since the launch of the blog I’ve been able to refer over $5 million in new business to my site partners, teach others how to make money online and also open up a whole new world of opportunity… such as being a keynote speaker in Australia, appearing on Fox News and ABC News, writing my own book and much more!